Kuwait aviation authorities have revoked the operation license of Wataniya Airways which was suspended for three months this year after the carrier left 1,500 passengers stranded in foreign airports following waves of flight cancellations, reports say. The Directorate General for Civil Aviation (DGCA) spokesperson Saad Al Otaibi told local Arabic newspaper that the airline’s license has been revoked because the carrier also known as Kuwait National Airways did not improve its operations despite several calls. In September the DGCA forced the aviation company to halt for three months its operation after leaving 1,500 passengers aboard due to lack of aircraft. The airline then said three of its four aircraft had gone out service. Ali al Fozan, Chairman of the airline despite the challenges insisted that the carrier’s financial position was sound and that measures would be taken to enhance operations. 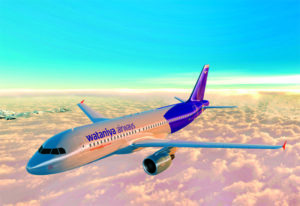 Wataniya Airways returned to business in July 2017 following a six-year hiatus. The firm currently operates four A320 family aircraft on routes that cross the Middle East, Africa, Asia and Europe. In July, it signed, via its exclusive aircraft provider Golden Falcon Aviation, an order of 25 Airbus A320neo jets worth around $2.8bn at list prices. Posted by KanelkaTagba on Dec 10 2018. Filed under Gulf News, Headlines. You can follow any responses to this entry through the RSS 2.0. Both comments and pings are currently closed.